It is Autumn in Linköping and the heavens have opened, but not even these biblical rains can wash away the blood of crimes past and present. Then the brutally-stabbed body of self-made Internet billionaire Jerry Petersson is discovered floating facedown in the moat surrounding his home, the imposing Skogså Castle. Malin Fors, the brilliant but flawed star of the Linköping police force, is already struggling to keep her life together following the recent murder attempt on her teenage daughter, Tove. Now, as the Petersson case forces Malin to delve deep into Linköping's history and her own family's past, the secrets she uncovers threaten to drown her, too . . . 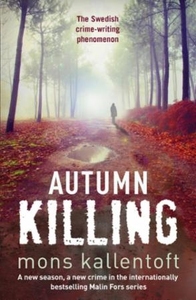 AUTUMN KILLING is the third book in the internationally bestselling Malin Fors series of Swedish crime novels featuring a brilliant and complex heroine to rival Sarah Lund of The Killing and Saga Norén of The Bridge.